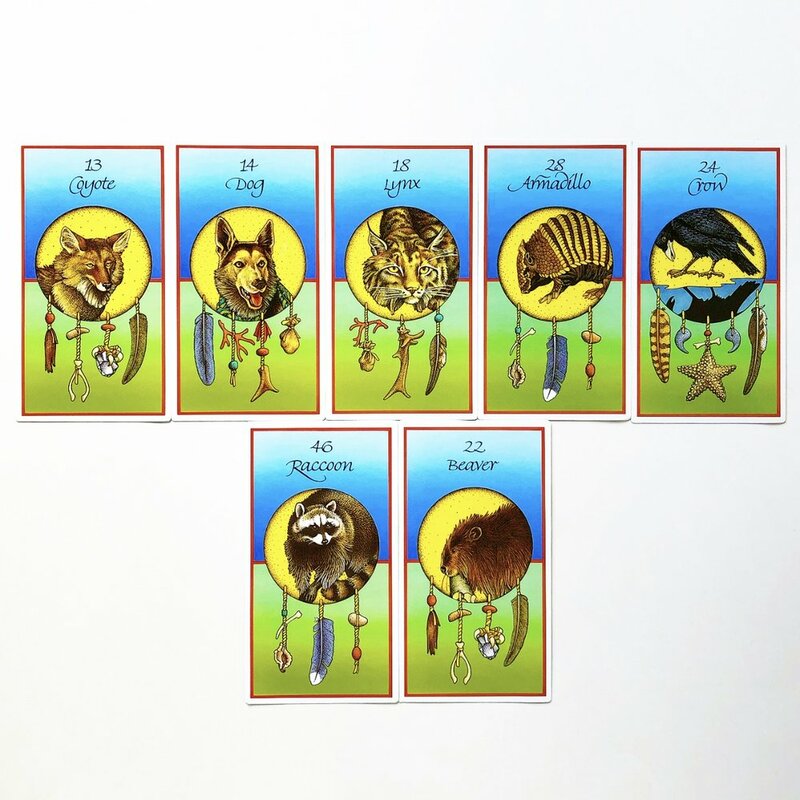 Monday 4/8 – Lynx – With intuitive gifts come responsibility. It is not always helpful or appropriate to share every vision, premonition, or download we receive, particularly if it pertains to the inner world or destiny of another. Trust that whatever information you’re picking up on is just as much, if not more so, a message about and for you as it is for others. Focus on how your intuitive hits might guide and inform your own life and choices, and leave others to find their own way in their own time. Tuesday 4/9 – Blue Heron Reversed - Wading through the watery depths of our inner world is a valuable undertaking, but make sure that you are actually connecting with the feelings that come up rather than simply intellectualizing them. Allow yourself to be with the abstract, hard-to-name experiences without needing to categorize them or tie them up into a nice, neat little package. If you want to know if you’ve truly integrated the lessons and growth you’ve been working towards, go out into the world and connect with others. Relationships are some of the greatest mirrors for where we have healed and where we still have work to do. 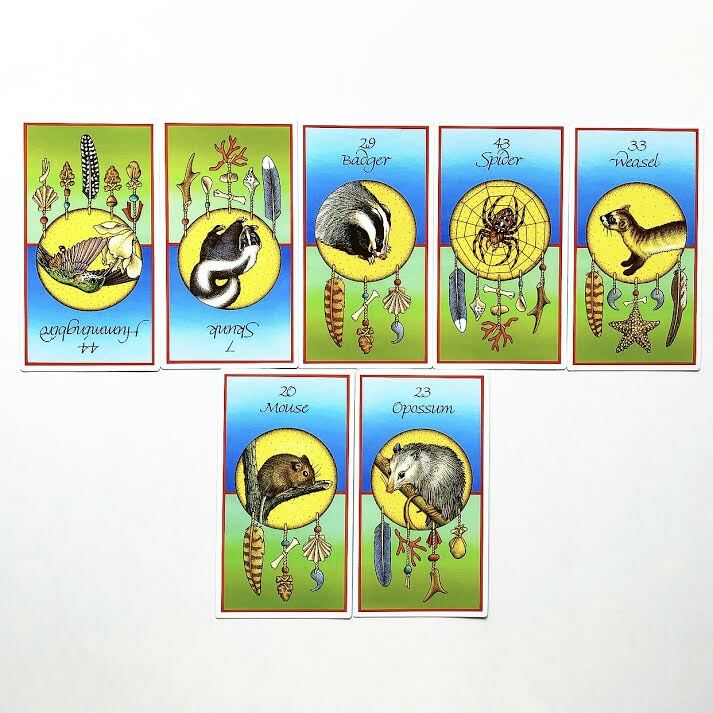 Wednesday 4/10 – Badger Reversed – Watch out for falling into aggressive energies today like reactivity, defensiveness, and reckless uses of power. Anger is healthy, but it must be transmuted if it is going to be constructive. Take deep breaths. Ground by spending time outside and/or placing your bare feet on the floor or, ideally, the earth. Channel your intensity into creative outlets like writing, painting, or movement. Remember that true power is in being able to choose how you respond to life, rather than reacting out of unconscious programming that rarely ever serves. Thursday 4/11 – Otter – Tap into the gifts of feminine energy today. Receptivity, open-heartedness, creativity, emotion, connection, expression, and intuition. We all have the capacity to embody these qualities no matter how we identify and, in fact, we must, to a certain extent, if we want to achieve a healthy and balanced spirit. If this softer, more abstract way of being feels way outside of your comfort zone, play at the edge and test out new approaches and perspectives. If nothing else, you will have gained a little more self-awareness, which certainly never hurts. Friday 4/12 – Swan – Have you ever had an experience in which you felt that you were supported by unseen forces or something greater than yourself? If so, then you know first hand what it is to be touched by Grace. It may have been something momentous or perhaps it was subtle and fleeting, but chances are, you weren’t the same afterwards. Open yourself up to wonder and awe today. Make space for the possibility that you are part of something so much bigger than you could ever fathom. Allow yourself to believe in magic and you just might start to see it all around you. Saturday 4/13 – Weasel Reversed – Even the most seemingly innocent forms of manipulation are still a setup for getting tangled up in icky energy. Stay above board today and if you want something from someone, just be direct and ask. Your request may be met or denied, but the sense of integrity that you cultivate by honoring others’ free will and refraining from using trickery or mind games for personal gain will be well worth it. Besides, anything you can lose from being honest is something you never truly had to begin with. Sunday 4/14 – Lizard – Dare to dream today. Allow yourself to weave the boldest, most beautiful visions of your life you can possibly imagine. Don’t worry about what’s realistic or not, but instead focus on the feelings and types of experiences that show up when you imagine your perfect day or week or year. Even if you don’t create exactly what you dreamt up, you’ll be working towards and in alignment with a frequency that feels most authentic and nourishing to you, and that approach will always land you exactly where you need to be. Monday 4/1 – Butterfly Reversed – We are all constantly undergoing cycles of transformation and, as part of this process, we must also undergo destruction to a certain extent. The caterpillar doesn’t know that it is on its way to becoming a butterfly when it wraps itself up in a chrysalis and begins to completely break down into something completely unrecognizable. It is only relying on instinct. A call that is so compelling that it can’t be resisted. We too hear these calls from our hearts and souls, and sometimes, the journey we must go on to answer that call involves surrendering, allowing ourselves to unravel, and then embracing the process of becoming something entirely new. This requires courage and a faith in your own inner knowing. Today you have the choice. Remain as the caterpillar and stay comfortably on the ground. Or answer the call, allow yourself to dissolve and disintegrate, and release anything that might be holding you back, so that you can emerge with wings. What will you choose? Tuesday 4/2 – Elk Reversed - It can feel safer to hide out and not share who you are fully and authentically, but, while that might protect you from rejection, it keeps you from ever really feeling a sense of true belonging. Share your voice, your message, and your unique way of seeing the world bravely. Allow people to truly see who you are and let the chips fall where they may. Your authenticity is the best litmus test for who is meant for you and who is not. Let those who don’t resonate with you go with nothing but love in your heart so that your energy and attention can be reserved for those with whom you can connect in a much deeper and more nourishing way. And the more you put yourself out there, the more your people will be able to find you. So no more playing small or muting your frequency. Shine brightly and true. Wednesday 4/3 – Lizard Reversed – Your dreams are not frivolous. They are some of the greatest clues to your deepest desires and your soul’s purpose, so do your best to make proper space for them to come through. Be sure to get proper rest, eat nourishing foods, and release unnecessary sources of stress from your life. Your body is the vessel through which you connect to your intuition so taking care of it is one of the most potent ways to open yourself up to receive the wisdom it holds. You might also want to set aside some time to be alone and, if possible, to drop into a meditative practice. It’s in stillness and quiet that we are often most able to hear the whispers of our hearts. Thursday 4/4 – Crow – We can’t live in the light without casting a shadow and it is so absolutely vital that we accept and acknowledge this truth. Every quality we have, both the ones that we deem as “good” and the ones we deem as “bad”, is a double-sided coin. Today we are being called to look at the parts of ourselves that we struggle to accept, to explore them with curiosity, and to uncover their gifts. It is only through compassionate self-acceptance that we are able to bring the parts of ourselves that we find challenging into the light and integrate them in a way that can serve both our own healing and that of the world. 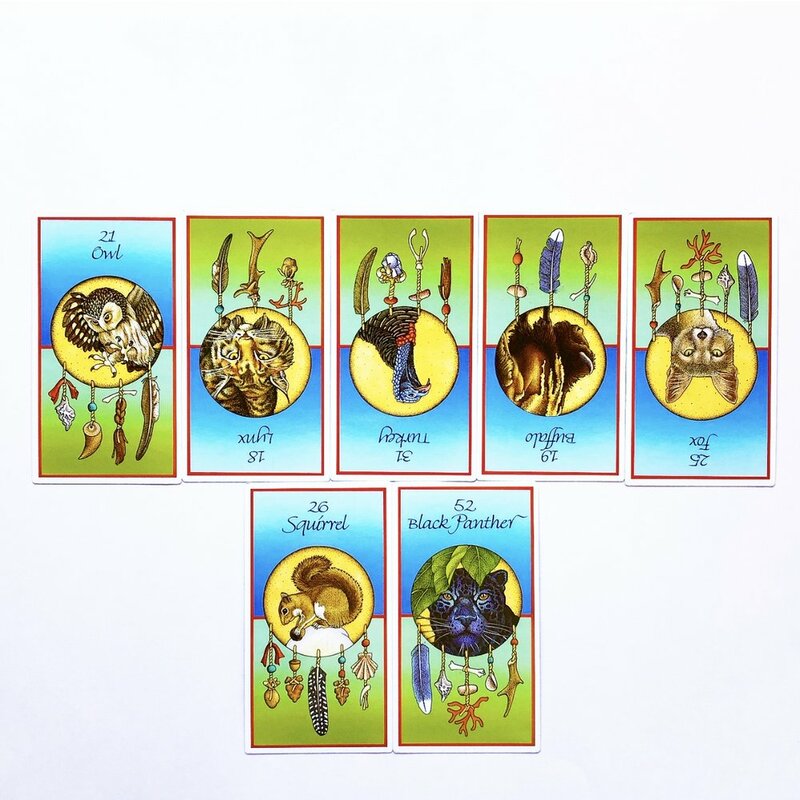 Friday 4/5 – Otter Reversed – We all carry feminine and masculine energies and the message today is about embodying the gifts of femininity in a healthy way. This means cultivating our capacities for being receptive, open-hearted, intuitive, expressive, creative, and patient. We are being asked to soften and to allow ourselves to surrender more fully into loving connection with others. If you find yourself tempted to act out in petty, jealous, or aggressive ways today, place your hand on your heart, breathe deeply into that tender place in your chest, and ask yourself how you can meet the moment or circumstances at hand from a place of love. Saturday 4/6 – Squirrel Reversed – The art of preparation is a delicate one and finding the balance between being lackadaisical and being neurotic can take some finesse sometimes. Ask yourself where you’re landing on that spectrum today and adjust accordingly. Could you put a little more care and energy into laying the foundation for the things you’re wishing to create in your life or is it time to practice surrendering and invite in a little more flexibility and flow? What resources do you really need to carry you through the season ahead and what can you let go of to make room for expansion? Our needs are dynamic and ever-changing so taking regular inventories of what is truly serving and adding joy to our lives (and releasing anything that isn’t) can help us live in authentic alignment with our values and visions. Sunday 4/7 – Frog Reversed – If you’ve been thinking about doing a Spring detox, now’s the time! And don’t limit it only to your dietary choices; we are constantly consuming things with our minds, bodies, and spirits and it’s important to cleanse each aspect of our beings regularly to avoid accumulating toxic, stagnant, or blocked energies. Whether you choose to reboot your eating habits, take some time away from the digital world, or explore practices that help you move and release energy, take good care of yourself along the way. It’s common to experiencing a little detox hangover or discomfort when changing our habits and some extra self care can help you stay the course so you that can come out on the other side feeling lighter, more radiant, and healthier. 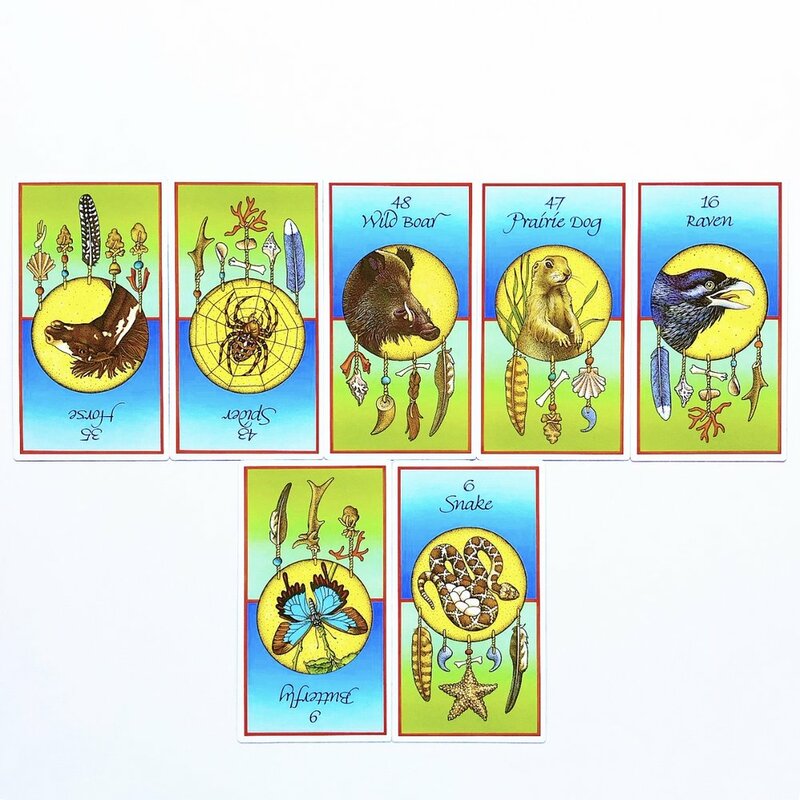 Monday 3/11 – Frog Reversed – As we move into a new week and a new season (hello, longer, warmer days), it’s time to shed any stagnation or excess that we’ve accumulated throughout the slower winter months. This can happen on a variety of levels--detoxing the mind through meditation, time away from screens, and intentional release of stories that no longer serve, cleansing the body through dietary shifts, sweating, either from movement or sauna sessions, and clearing heavy energy from your spirit through breathwork, time in nature, and proper doses of downtime and play. Whatever you need to do to meet this next chapter of your life feeling renewed, vibrant, and healthy, do it! Tuesday 3/12 – Porcupine Reversed - Never underestimate the power of a light spirit! Yes, life can be fraught with challenges and obstacles, but when we tense againsts these experiences and respond with bitterness, anger, or a closed heart, our struggles are only multiplied. Approach life with curiosity, a sense of wonder, a willingness to let the little things go, and a commitment to staying tender, even in the midst of the fire, and you will be so much more open to receive the beauty and growth that is available to you in each and every moment. If you are having an incredibly hard time finding this perspective, go in search of laughter. It is some of the simplest and most profound medicine and will bring you back to the inherent joy that is your birthright, if you let it. Wednesday 3/13 – Wild Boar – Sometimes confrontation is unavoidable, but that doesn’t mean you have to approach it with aggressiveness or a lack of compassion. Do your best to make sure that any conflict you are navigating has a productive outcome rather than a destructive one, and start by creating space for both sides to feel seen, heard, and valued. You can honor and uphold your own needs and boundaries, while being kind. The key is to focus more on coming from a place of self-love and directness, than from one of judgment and passivity, which can often lead to a build up of resentment and much bigger blow-outs down the road. Say what you need to say, create space for the other party to take in your perspective, and then do your best to not take the response personally, but as information on how to proceed. Thursday 3/14 – Mouse – With Mercury in the midst of its retrograde transit, it’s especially important to pay close attention to the details. Of your day-to-day habits. Of the words you choose. And most definitely of any contracts or agreements you are considering signing. Take a personal inventory of all of the areas of your life, from work to home to relationships to self care practices, and assess for places where you may be leaking energy or working against yourself. Some tiny tweaks could mean the difference between spinning your wheels and actually bringing your dreams and visions to life. 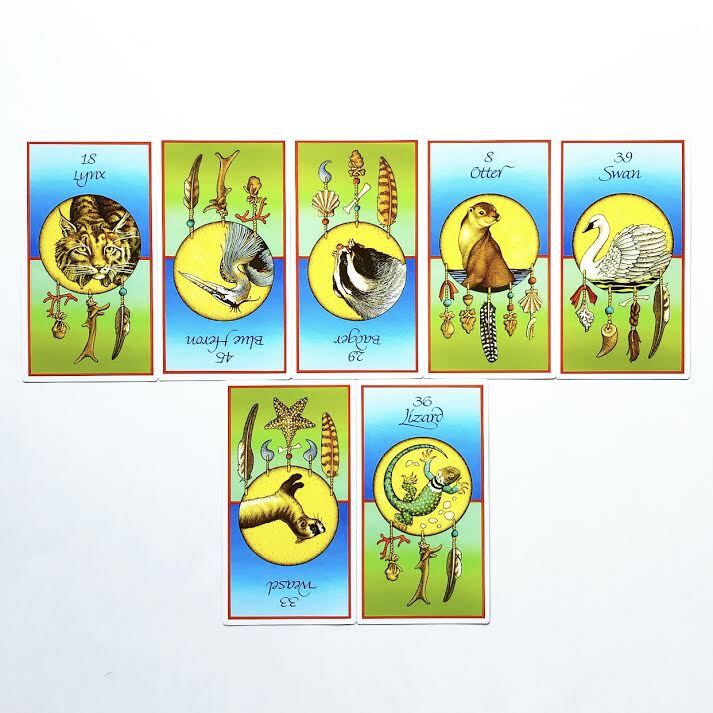 Friday 3/15 – Turkey – Nothing attracts opportunities and abundance like a generous spirit and today is a beautiful day to cultivate that within yourself. Ask yourself where you might be able to be of service to those within your community, be that local or more globally. Sharing your time and money resources with those less fortunate can be a beautiful way to give back, but more than anything, it’s about the energy with which you move through the world. See if you can find even the smallest opportunities to uplift each person you encounter today so that they walk away with a sense o. You may find that some just how special they are. Some of that good energy you’re putting out into the world may even come back around and leave you feeling more abundant and grateful than you did at the outset of the day. Saturday 3/16 – Bat Reversed – The only constant in this life is change and yet so many of us resist the shifts and evolutions that we inevitably must move through. If this is coming up for you today, first and foremost, know that you are not alone. That this is so very human. And also, that you are only being presented with the challenges at hand so that you can grow and step more fully into your power, gifts, and light. Ask yourself if you could simply embrace each moment as if you had chosen it, and then milk it for every bit of learning and healing you possibly can receive. You are stronger than you think and you’ve got what it takes to make it through to the gifts on the other side. Simply take it breath by breath, be as present as possible, and make the choice to view your circumstances as an adventure, even if they might also sometimes feel like an ordeal. Sunday 3/17 – Jaguar Reversed – Your relationship to integrity is one of the strongest influences on what kind of frequency you are putting out in the world and what you are calling into your own life. You can talk about the visions you wish to manifest all day long, but if your actions aren’t backing up your words, you’re sending mixed messages ot the universe, and probably to everyone around you as well. It’s time to bring your life into alignment by making sure that it’s a vibrant embodiment of your values and an authentic expression of who you are and who you wish to become. Once you start walking your talk, you’ll begin to develop a deeper sense of trust in yourself and an ability to radiate the confidence of someone who is living from a place of empowerment. And there’s really nothing quite as magnetic as that. Monday 2/25 – Grouse Reversed – It can be easy to forget what a gift it is to get to live life in a human body. We can forget how magical our very own heartbeat is, the way our lungs expand and contract, all the systems inside of us that are constantly working to achieve homeostasis so that we can wake up and greet the day. Spend some time today reconnecting with the blessings of your physical form and express your gratitude by using what you’ve got. If you can run or dance or jump in the ocean, do it! If you can move your fingers across your own skin or simply feel the cool breeze or warm sunlight caress your body, let yourself soak that in. Our time here is limited, and the awareness of that can be a call to be more present with the beauty that’s right in front of us in this very moment, the only one we’re promised. Tuesday 2/26 – Black Panther - The more that scientists study our planet and the universe, the more we see that absolutely everything is interconnected, moving in rhythm, a giant and unfathomably intricate cosmic dance. You don’t have to believe in a traditional idea of a god to see the divinity within that or to understand that you are playing your own tiny, but important part within the greater picture. Remember that today, when you encounter circumstances that leave you uncertain about your future or what your place is in this world. Trust yourself, your ability to meet whatever comes your way, and in the natural order that is guiding you through the seasons just as much as it is the plants and animals and elements. Wednesday 2/27 – Swan Reversed – Sometimes to find a true sense of belonging, we have to first let go of the desire to fit in and that’s what’s called for today. You can’t uncover your own gifts if you’re too busy watching what everyone else is doing and getting mired in comparison mode. Get back in your own lane and while you’re there, start paying attention to what makes you unique because that is where your soul purpose lives. You’ll also be much more likely to attract in people and opportunities that truly align with and complement you once you start emitting your own authentic frequency, so go ahead and shine in the way that only you can. Thursday 2/28 – Dragonfly Reversed – Release the illusion that your current perspective is the only way to view things or is Truth in an absolute sense. We all see the world and our experiences through unique filters or lenses that are created through the complex interplay of our upbringings, our biological makeup, social conditioning, and so many other more subtle influences. The goal isn’t to rid ourselves of this lens but to maintain an awareness of it and to consider the possibility of other perspectives being just as true or valid as our own. Open your mind and you may just find a well of creativity you’ve not tapped into previously, a heightened awareness of opportunities that are available to you, and the ability to connect more deeply with people who have ways of viewing the world that are refreshingly different than your own. Friday 3/1 – Blue Heron – Our inner worlds are so vast; we rarely even scratch the surface of what lives within our hearts and minds. Creating time for stillness and reflection is vital if we want to develop an intimate relationship with our own spirit and today is an especially potent day to do so. If you struggle with sitting meditation, try a movement meditation like mindful walking or expressive free-form movement. Allow yourself to really drop into your own experience and be present as the layers come up, one by one. There’s no goal here other than to become more attuned to the quieter parts of your experience that may often get buried under the busyness and distractions of day to day life. There’s really no greater power than knowing yourself deeply, so empower yourself and spend some time exploring the wilderness within today. Saturday 3/2 – Bear – The call to go inward continues today. Nearly everything in nature has a season of dormancy even if only briefly or in a subtle way. Humans have created structures that allow us to continue our fast pace and outward focus on productivity even through the winter months, but that doesn’t mean our very nature doesn’t still call for a time of deep restoration. Our bodies undergo certain healing processes only when we allow ourselves to drop into the deepest stages of sleep and our hearts, minds, and spirits need regular periods of rest and quiet as well, so tend to your being today by taking time to get cozy, let go of the need to “do”, and simply just “be”. Sunday 3/3 – Porcupine – Many of us don’t often think of vulnerability as a sign of strength but it absolutely requires courage, deep self-awareness, and an ability to set clear, but compassionate boundaries—none of which is for the faint of heart. And yet, without allowing ourselves to be vulnerable with others, we never experience the full beauty and power of true intimacy, one of the greatest gifts in this human experience. The one caveat here is that is important to be discerning when choosing to whom you offer up your tenderness. If you don’t have people in your life who you can trust with the softest parts of your heart, ask yourself why that is. If it is simply your own fear getting in the way of healing connections, it’s time to get brave. If you’ve chosen to surround yourself with people who don’t honor all of who you are, then it’s time to look at your own relationship with self-love, cultivate a connection to your intrinsic worth, and then find people who can reflect that back to you. And don’t forget that while this is deep work, it doesn’t have to be heavy. Laughter and play are some of the most powerful medicines on our healing journeys so be sure to engage in both regularly. Monday 2/18 – Bat Reversed - Transitions, especially ones we didn’t invite in, can bring up all sorts of things for many of us. Fear. Resistance. A desire to cling or control. But if we can relax into the shift and trust, even as the ground moves underneath our own feet, that we have the skills necessary to navigate whatever may come our way, we open ourselves up to more fully receive the gifts available to us, both throughout the process of change and on the other side of it as well. Accept the challenge. Rise to the occasion. And allow it to strengthen and purify you, like a sword, forged in fire. Tuesday 2/19 – Mouse Reversed – The devil’s in the details today so whatever you do, be sure to be thorough. Double and triple check any important work, and take some time to make sure that all of your systems are in good order—from your home to your body to your work life. You might also consider doing a little spring cleaning while you’re at it, and again, that doesn’t have to be limited to your physical spaces. Removing anything extraneous, internally and externally, will allow you to get a clearer picture of what’s working, what isn’t, and what might need a little extra attention today. Wednesday 2/20 – Spider Reversed – We all have creative energy that wants to be expressed in one way or another and it is absolutely vital that each of us finds healthy ways to outlet that energy, so that it doesn’t find its way out through less positive or potentially destructive/self-destructive means. If you haven’t found your unique form of expression, spend some time exploring today. Put pen to paper. Grab some paints and allow yourself to just play without any goal. Turn some music on and move your body. Sing. Build something. You might be surprised by not only what comes through you, but also by how much of a release you feel from these simple practices. Thursday 2/21 – Lizard – Your dreams are not random, but are filled with clues to things that live within the caverns of your heart and mind. Pay attention today to where you go when your mind wanders or the images that come forward while you slumber. Notice if anything feels familiar, reminds you of an experience from the past, or leaves you with a strong emotional residue. And if you find yourself uncovering unmet desires or unattended to fears, then create some space to be present with what’s there. The more you learn about what lives in the depths of your soul, the more able you will be to create a life that is authentic and aligned. Friday 2/22 – Ant Reversed – Patience is a virtue and one that requires practice for most of us. If you’re feeling frustrated or like your every move is being blocked today, try stepping away from your endeavor and allowing yourself enough space to reconnect with a sense of ease. You never know when a delay might actually be divinely orchestrated to redirect you to something that is even better, so hold room for that possibility today and take as many deep breaths as necessary to surrender into the pace that life seems to be guiding you towards. 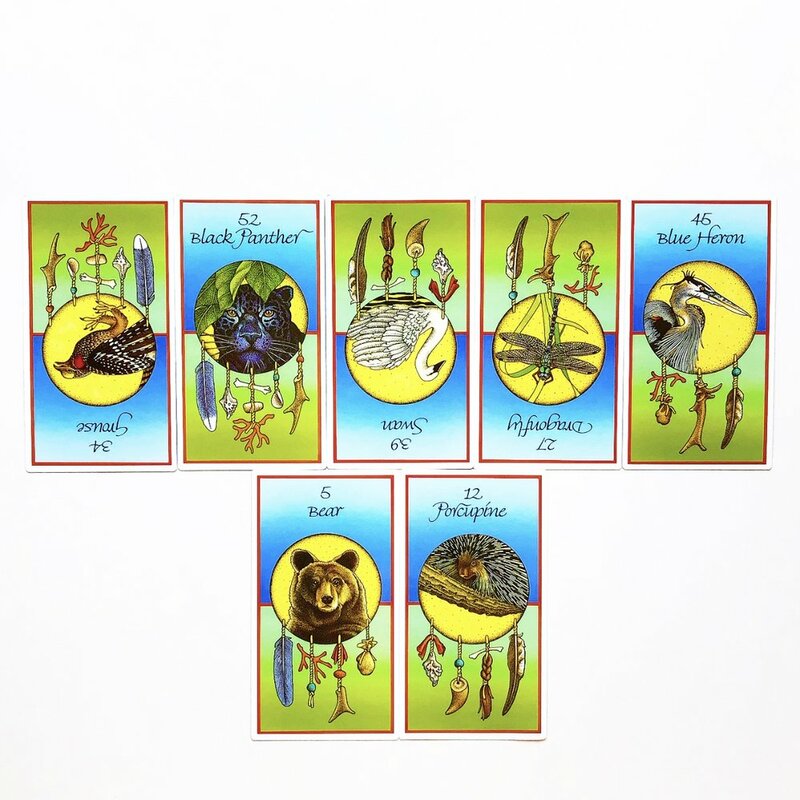 Saturday 2/23 – Beaver Reversed – Building things that are meaningful to you is an important part of creating a fulfilling life, but protecting what you create is important too. Have you been undoing your hard work lately by giving into forms of self-sabotage, big or small? If so, it’s time to address the unacknowledged feelings or needs that are driving those behaviors. How can you tend to your mind, body, and spirit so that you are less inclined to seek out hollow substitutes for nourishment? Once you find more effective ways of meeting your own needs and desires, you’ll find that everything around you will start to blossom much more fully. Sunday 2/24 – Porcupine Reversed – Sure it’s important to be responsible and take care of business, but don’t “adult” so hard that you forget to find joy in the simple pleasures of life. The quickest antidote to overly heavy and serious energy is play and that’s exactly the medicine that is being called for today. Cut loose. Get silly. And leave your worries behind for a while. Whether you choose to do this solo or to enlist friends, make sure that you spend some time today engaged in activities that allow you to be fully present, creative, and authentic. Sometimes we even find the very best solutions to issues or problems we’ve been trying to work out when we step away for a bit, so consider your play time part of your productivity process if necessary. Monday 2/11 - Owl - Be sure to use all of your senses today, especially your more subtle ones that you may not always tap into, because there may be more to a circumstance than you can see at first glance. Listen to your gut, the way your breath shifts, the tingles across your skin, and especially to the whispers in your heart. And then observe. The truth will reveal itself in time, and once it does, you’ll be better able to make a decision with full awareness of what is and is not in alignment for you. Tuesday 2/12 - Lynx Reversed - Just because you see something in someone, doesn’t mean you always have to speak it. We are each navigating our own unique and mysterious karmic paths; by confronting someone with information they might not yet be ready to hear, no matter how truthful it may be, we risk interfering with healing processes that are vital for that person’s soul journey. Instead, offer tender support and a safe, non-judgemental space for people to explore and uncover their own beliefs and feelings about things. If and when they’re ready, they’ll invite you in to their process. Until then, stay in your own lane and redirect your energies towards your own inner work. Wednesday 2/13 - Turkey Reversed - If you’ve been struggling with a case of the “not enoughs” lately, the solution may be to do the very thing that probably feels the most challenging--give more. Look around you and figure out the place where you do have abundance, as wealth comes in many forms. You can be rich in friendship, time freedom, humor, creativity, material resources, and so many other ways. Think outside of the box today about ways that you can share from your overflow and be of service to others. You might just find that practicing this spirit of generosity is the very key to moving beyond scarcity mentality and attracts more of what you truly need into your life. Thursday 2/14 - Buffalo Reversed - Sometimes, before we can release ourselves from scarcity, mentally, emotionally, and physically, we have to heal the wounds the brought us there to begin with. This is deep work and requires incredible tenderness and compassion, but holds some of the greatest rewards if we’re willing to confront it. It looks like returning to the source of our beliefs that we are not worthy, of love, of wealth, of radiant wellness, and forgiving the ones that harmed us, with the knowledge that they were most likely only passing on wounds of their own. This forgiveness is not a passive process. It is one we undertake day after day, until we are free and able to honor and embody the divinity that lives within each of our hearts. Friday 2/15 - Fox Reversed - While it’s generally a good practice to let your light shine brightly so that you can call in the experiences and people that are in alignment for you, today you’ll best be served by hanging back a little bit and practicing the art of blending in. There may be someone in your circle who is out of sorts and looking for a place to unload their frustration. You can avoid getting tangled up in their energy by laying low and refraining from calling a lot of attention to yourself. By tomorrow, they’ll most likely have worked through whatever was coming up for them, and you can take off your invisibility cloak without any concern over getting caught up in the crossfire of someone else’s inner battles. Saturday 2/16 - Squirrel - Balance your play today with a healthy dose of practical self-care in the form of preparation for the week ahead. Getting your home in order, clean out those inboxes, and maybe even do some meal prep. These tasks may seem fairly simple and mundane, but they can go a long way towards helping you feel focused and supported in the week ahead, especially if something comes out of left field to derail your schedule. While you’re at it, it might also be a good time to do a little early-Spring cleaning in the form of a purge, Marie Kondo-style. Sometimes we don’t even realize how much certain things in our lives are weighing us down until we release them, and that goes for more than just material items. If it doesn’t bring you joy, it’s time to let it go. Sunday 2/17 - Black Panther - One of the greatest acts of faith we can offer, is to step into the unknown with full trust. Today, that’s exactly what is being asked of us. Release any need to know the outcome or control the circumstances around you and greet each moment as if you had chosen it. If this is something you struggle with, as so many of us do, spend some time in a grounding practice, either through breath awareness meditation or connection with nature, to allow yourself to tap into the center of stillness that lives within each of us. From there you’ll be more able to remain present and open to whatever comes your way. Monday 2/4 - Salmon Reversed - It’s time to reconnect with your sense of home, physically, but more importantly on a spiritual level. Who are you at your core and if you’ve strayed from that recently, what do you need to do to be fully embodied in you truth? If you’ve been working towards a goal but feel like you keep getting met with resistance, it might be time to consider whether this pursuit is being driven by your heart or your ego. If it’s the latter, you could be setting yourself up for disappointment when the results don’t weigh out against all the effort you’ve put in. If your heart is in it however, keep chugging along, pace yourself, and trust that you will always end up exactly where you are meant to be. Tuesday 2/5 - Armadillo Reversed - Boundaries came up last week and it seems like the lessons around that very important piece of self care and relational life are still at play. Direct a little extra attention today to the interactions or even personal habits that leave you feeling hurt, angry, or resentful, not to ruminate, but to gather information about what does and doesn’t feel good for your mind, body, and spirit. And then practice speaking up and expressing clearly what you will and won’t accept from others (and maybe even from yourself). Wednesday 2/6 - Owl Reversed - You may not be getting the full picture today so be sure to trust your intuition if you feel like something is off or perhaps not as it seems. Instead of relying solely on what you see or hear, tap into your more subtle senses—the feeling in your gut or chest, the tingling sensation that runs across your skin, the voice that seems to come from thin air offering a message that may not necessarily make logical sense in the moment but resonates throughout your body as truth. And this applies to knowledge about yourself as well. If you feel guided to pursue a certain path of self-discovery or healing, by all means answer that call. Thursday 2/7 - Crow Reversed - Sometimes we find ourselves in circumstances where everyone around us seems to be ready to hop on a bandwagon that doesn’t appear to be very steady and in those moments it is up to us to tune into our own internal guidance system to determine what course of action we will choose. Today is one of those days. What is “legal” or socially acceptable isn’t always the same as what’s right and when you really connect with the wisdom of your heart, you will know the difference. Choose to do the right thing today, no matter who’s watching or what they think. When your head hits your pillow at night, you’re the only person you have to answer to. Friday 2/8 - Bat - Growth, evolution, and change are constants, if we’re actually living that is. And resisting this truth is at the heart of so much suffering. Embrace any transitions that seem to be sweeping through your life, internal or external. Trust that, even if the road gets a little bit bumpy, you’re headed towards a wondrous future and an even truer, more empowered version of yourself..because you are. Saturday 2/9 - Wild Boar Reversed - Most of us do our best to avoid confrontation, but sometimes, no matter how hard you try, that’s exactly where you find yourself. And truthfully, it can be exactly what’s called for in certain moments. Make the best out of a challenging situation today by staying calm and grounded and you might even find that any disagreements that take place end up being quite productive. If necessary, vent out any intense emotional charge onto paper or to a friend (with their consent, of course) before you hash it out with the party or parties in question, that way your arguments stay centered in reason and are much more likely to be considered. Sunday 2/10 - Prairie Dog Reversed - If there ever was a perfect day to carve out some intentional time to rest and recharge, today is the day. Even if it’s only a matter of minutes, be sure to create a little space for yourself to take a deep exhale, particularly if you’ve been feeling a little burnt out lately. You are only human after all and you’ll find that a little restorative time can be a powerful investment in your ability to stay energized and focused for the long haul. If you can dig into some truly nourishing or indulgent self care today, all the better. Either way, taking some quiet time away from the hustle today will see you starting the week ahead feeling bright eyed, bushy tailed, and ready to tackle whatever comes your way. Monday 1/28 - Squirrel - You might be tempted to start the week off at full speed, but pace yourself. You may have some unexpected circumstances crop up this week that require a little more energy than expected so make sure that you’re keeping your reserves filled up and that you don’t burn yourself out before your week is really even underway. You may also want to do a little extra organization and prep work for any bigger projects that you’re planning on completing this week. If you already have all of your ducks lined up nicely, you won’t have any problem knocking everything out, task by task, even if you get derailed by snafus, a low energy day, or something urgent that comes up. Tuesday 1/29 - Dog - Loyalty is a powerfully attractive quality and one that inspires trust among connections, old and new. It looks like standing up for people you care about, investing energy back into those that have invested in you, and being a dependable source of support for your people. Whether you’re feeling incredibly abundant in the area of relationships or you’re finding that it might be time to bring some new faces into the mix, take a personal inventory of ways that you can show up as a more loyal friend, family member, or partner and then take action. You might just find that the tiniest gestures of kindness and support end up coming back to you in big ways down the line, so be generous in spirit and make sure that you’re taking care of the ones who’ve had your back through thick and thin. Wednesday 1/30 - Porcupine - If you’re feeling bogged down with a case of the hump days it might be time to infuse a little more playfulness into your approach today. It really all comes down to perspective. You can see that extra stack of work that just landed on your desk as tedious and burdensome, or you can decide to make a game out of it. Race your co-worker at the neighboring desk or set up a reward system for yourself to boost your morale and keep yourself motivated. If you can pop in some headphones and listen to music while you work, all the better! Just remember, you are the architect of your own experience and you get to decide what energy you carry into each and every situation. Why not make it a joyful one? If only to bring a smile to your own face. Thursday 1/31 - Weasel Reversed - Shining brightly is one of the most powerful ways to call in the opportunities and people that are meant for you, but sometimes light attracts moths, too. Keep an eye out today for anyone who might be trying to infiltrate your energetic space. Sometimes people aren’t even aware that their behaviors are being driven by manipulative or lack-based tendencies, so no need to confront anyone or be unkind. Simply maintain an awareness and keep a safe distance, at least emotionally/energetically if not physically as well, from anyone that you can feel pulling for your time, resources, or attention in a way that leaves you feeling drained or frazzled. If you don’t feed them, they’ll be much more likely to move along and leave you alone. Friday 2/1 - Alligator Reversed - Life can move so quickly sometimes that before we know it, time has completely escaped us and it’s hard to even remember where we’ve been. Make a point of taking time to pause today, reflect on your journey in recent weeks and months, take stock of any lessons you’ve gleaned, and don’t forget to celebrate your successes and accomplishments, no matter how small. This will not only help you to avoid making the same mistakes twice (or three or four times), but will also help you ground down into the present, which holds so much beauty. Insead of grasping constantly for the next thing or achievement, allow yourself to really acknowledge how much progress you’ve made, so that when you resume your journey, you have a stronger sense of orientation, direction, and ease. Saturday 2/2 - Armadillo - Repeat after me: Boundaries are my friends. Make that your mantra today (and every day really). Many people confuse boundary-setting with being rigid or blocking connection with others but nothing could be further from the truth actually. Boundaries are all about knowing yourself, what you will and will not accept from others, expressing that clearly through your words and actions, and being willing to walk away from any dynamics that don’t allow you to honor your needs and personal sovereignty. When done compassionately, setting boundaries actually paves the way for deeper and more authentic connection, certainly to yourself, but with others as well because it creates a sense of safety and freedom within intimacy. So get clear about what you’re willing to let into your space and what you’re not, and promise yourself you’ll let anyone go who can’t respect your boundaries, with love, of course. Sunday 2/3 - Opossum - Sometimes people come into our sphere that can’t be reasoned with at all and in those cases it’s best just to “play dead”, so to speak. If you find that someone keeps trying to engage you in conflict or is bound and determined to knock you down a rung, do your best to simply avoid this person today. The bee that’s buzzing around in their bonnet most likely has nothing to do with you anyway so give that person a wide berth and if contact is unavoidable, remain neutral. You don’t have to pretend to agree with the other person, but simply letting them know they have been heard, that you’ll take their perspective into consideration, and then leaving it at that will go a long way towards keeping you from getting roped into drama that won’t add anything positive to your life. Save yourself the headache and steer clear so that you can close out your weekend on a happy note. Monday 1/21 - Horse Reversed - Have you been struggling to stand in your power in a balanced way lately? Swinging like a pendulum between the extremes of not standing up for yourself or others at all and then using excessive force, either physically or energetically? If so, it’s time to ground, reclaim your authentic power, and exercise it mindfully and compassionately. This begins with self-awareness and appropriate boundary setting and is supported by taking the time you need, on a regular basis, to check in with yourself and your own needs and then tending to them so that you don’t end up feeling stretched too thin, only to snap. When you are attuned to your inner world, you can engage with your outer world in a much more effective and empowered way. Cultivate this ability and you are sure to see waves of positive shift across all areas of your life. Tuesday 1/22 - Spider Reversed - There’s a risk today of saying or doing something from a place of frustration unless you find appropriate outlets for expressing yourself, so get creative. It doesn’t matter what medium you choose but it’s vital that you find a way to channel your energy into something positive. Draw, paint, make music, build something, dance, and as you do, envision any heavy or intense energy flowing right out of you and into your creation. It’s not so much about creating a masterpiece as it is about funneling your pain, anger, or frustration into something else so that it’s no longer binding you or weighing you down. Wednesday 1/23 - Wild Boar - The message for today came through loud and clear and it’s that today is not a day to be meek. Most of us do our best to avoid conflict, but sometimes it’s absolutely necessary to fight for yourself, the ones you love, and for what you believe in. This doesn’t mean you have to pull out all the weapons or resort to aggressive attacks, however; remain calm and dignified, but stand your ground. Those who oppose you will either yield or remove themselves from the equation entirely, and either way, you’ll be happy that you didn’t compromise your integrity or your well being just to avoid rocking the boat. Being liked isn’t the same as being valued or respected, and if you have to choose between the two, the latter is far less likely to leave you feeling like a doormat. Thursday 1/24 - Prairie Dog - With all of the heightened energy of this week, it’s important that you set aside a little time to relax and restore your body, mind, and spirit. Today would be an especially good day to schedule in some solo self-care in the form of time in nature, a meditation session, a cozy afternoon curled up with a book or some soothing music, or a visit to a bodyworker if that’s in your budget. Whatever you do, make sure that you really allow yourself the space to properly unwind because you’ve got some big opportunities on the horizon and you want to make sure that you don’t burn out before you get there. If you have a hard time slowing down and feel guilty for taking time away from the grind, just remember, slow and steady wins the race. Play the long game and take the down time now so you can cross the finish line with enough energy to enjoy your accomplishments. Friday 1/25 - Raven - The week seems to end on a magical note, or at least, it can if you stay open to the possibility. When we’re children, we see magic all around us, in puddles and rainbows and even in the darkness beneath our own beds. But somewhere along the way, many of us lose connection with that way of seeing the world. We tack logical explanations onto everything and dismiss synchronicities as mere coincidence. It doesn’t have to be this way, though. You can know the reasons why and still hold space for wonder, curiosity, and awe. Allow yourself those gifts today. Focus in on all the little sources of magic that present themselves to you. Be present with beauty, the way you were as a child. You might just find that there’s a whole world of magic that’s been right under your nose for quite some time, only waiting for you to notice it. Saturday 1/26 - Butterfly Reversed - If you’ve been hesitant to embrace changes that seem to be sweeping through your life, it’s time to surrender. Yes, you may experience loss, growing pains, or fear of the unknown but this is all part of the process of transformation. Just as the caterpillar has no idea that it is destined to become a butterfly, you cannot even begin to imagine all of the beauty that awaits you on the other side of the shifts that are taking place. Hang tight, even if it feels like you are coming undone. There is a brand new you that is preparing to emerge and your only job right now is to trust that you are only ever becoming what you were always meant to be. Sunday 1/27 - Snake - One of the most powerful ways to heal is to turn your pain into purpose and that is exactly what is called for today. Share your story. Help someone out who struggles with the same issues you have had to face. Turn the tables on your troubles by fully owning them and then scouring them for treasure, and the treasure is always there; finding it simply requires a willingness to trade out self-pity for a commitment to learning and growth. If the lessons are feeling particularly tough, lean into any practices that you find to be healing, whether that’s mindful movement, working with your breath, or intentional creativity. A little extra self-care can go a long way towards supporting your ability to alchemize your struggles into something that not only makes you stronger, but offers healing to the world around you as well. Monday 1/7 - Squirrel - It’s the first full week of the new year, which means that if you were still trying to make your way out of the holiday haze last week, it’s time to get back in the game. Use today to lay the foundation for any projects you want to get underway or maybe even complete in the upcoming weeks and months. Never underestimate the importance of the preparation phase. A little time spent organizing and getting your strategy clearly laid out can be the difference between going the distance and gassing out. One way to get geared up for a big goal is to envision the moment that you complete it and then work backwards from there. What did you need to do just before you crossed the finish line? And then what needed to be handled just before that? And so on...Work your way back to where you are now and then you’ll know exactly what your first step should be. Tuesday 1/8 - Black Panther Reversed - No matter how long our lives have been stable for, life will always eventually throw us a curveball at some point or another. A sudden shift in your work environment. Changes within an important relationship. Maybe even changes within your own heart and mind that alter how you relate to your own life. We can’t always control what comes up in life, but we can decide to stay open, to embrace the constant ebb and flow, and to trust that everything is happening for us, to serve our growth, and to ultimately lead us to the very place we’re meant to be. If you’re finding yourself getting caught in the fear trap, breathe deeply and connect with your heart center. Ask you ancestors and the elements to support you. And remember that you have made it to the other side of every obstacle you’ve encountered so far. Maybe even stronger, and most certainly wiser, than before. Believe in yourself and allow that faith to give you strength and courage as you move forward into the unknown. 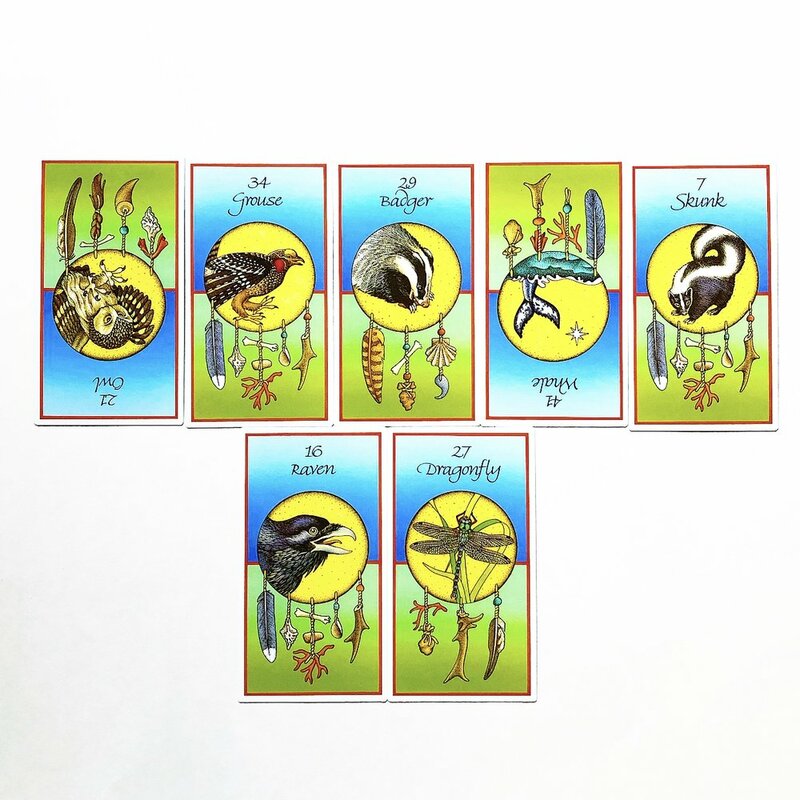 Wednesday 1/9 - Hawk - Signs will present themselves today, but it is up to you to stay open to them, to create enough space and stillness to be able to receive them, and then to allow your heart to feel their meanings. It may not always be something so obvious as a magic 8 ball tell you to “go for it”. Sometimes we can receive messages from strangers who have no idea how significantly their words land with us or from the elements reminding us of parts of our spirit that need tending. Unusual sightings or interactions with animals are never coincidental and, while there are common meanings attributed to different animal encounters across different cultures, don’t underestimate your ability to interpret your own experience as well. You intuition can be an incredibly powerful guide in your life. But it must me developed like any other skill or gift--through practice. Thursday 1/10 - Lizard - Today is a day to pay special attention to your dreams, both those that come while you slumber, but also those that come while your eyes are open as well. They are not frivolous but rather calls from your soul, guiding you towards your path. If you find your mind wandering repeatedly to something specific, be that a creative idea or a vision of travel or problem that has yet to be solved, set aside some time for yourself to give you attention to that in an intentional way. Ask for the meaning or solution to be revealed to you and then sit in silent meditation or put a pen in your hand and allow yourself to write from free association without judgement about what comes out. You might be surprised by the messages that come forward, but don’t dismiss them. Even if they don’t make perfect sense at the moment, trust that you are gathering pieces of the puzzle and the picture will become clearer as you move forward. Friday 1/11 - Dog - In a world where there is background noise almost constantly, it can sometimes be a challenge to hear our own hearts, but today, that is exactly your task. There may be many energies in your environment pulling for your attention, trying to influence you, and wanting you to join their team or cause. It’s not that they are necessarily selfish or malicious, but we all want to have our needs and desires met, so it’s important that you stay centered in your own truth, as no one else can do that for you. What are your deepest values? Who and what do you stand behind? Get clear about the answers to these questions and then make sure your actions are authentic and aligned. 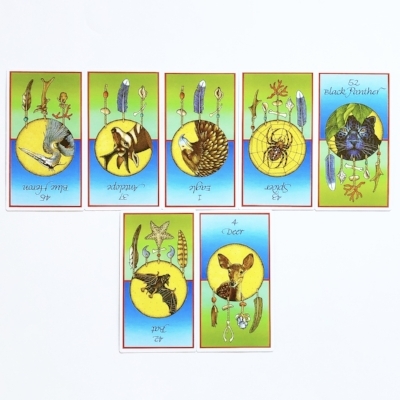 Saturday 1/12 - Owl - There’s more than meets the eye to someone in your field today. If your gut is telling you that something isn’t adding up, listen to it. No need for confrontation; simply take a step back and observe the situation to gather more information before taking any action. Pay particular attention to how people’s behaviors and choices do or do not match up with their words and then determine how much you want to engage with them accordingly. While you’re at it, it might be worth taking the same inventory of yourself. Often when we hides things from ourselves, it shows up in our external circumstances. If someone unsavory has wandered into your life, ask yourself how you might also embody the very qualities that you find yourself judging in others, even if only in very subtle ways. Shadow work isn’t always pretty, but it sure does clean up the energy you’re emitting and, as a result, the energies you’re attracting in as well. Sunday 1/13 - Raccoon - If you’ve received support from your community in recent seasons, it may be time to turn around and pay it forward. Look around and see if there is anyone in your circle who could use a helping hand. Whether that’s in the form of a sounding board or words of encouragement or maybe even working with them to get the wheels moving on a passion project of theirs, giving back to those in your community can bring deeper meaning into your life and keep kindness and a sense of abundance flowing for everyone. Just make sure that you are empowering others rather than infantilizing or enabling them. Your support should be like a breeze that lifts them up into the air, but after that, it’s up to them fly. Monday 12/31 - Prairie Dog Reversed - While New Year’s Eve is often a time of boisterous celebration and indulgent gatherings, a quieter, more intentional approach to closing out the year may be called for today. That doesn’t mean that you shouldn’t ring in the new year joyously, but perhaps consider taking some time during the day to do some solo reflection on the journey that the past year has taken you on. The challenges, the successes, the learning, growth, and love. What are you most grateful for? How has your life shifted? What can you shed and what would you like to cultivate going forward? If you’re feeling social come nightfall, join in on an intimate gathering at which you can connect with others in a soulful way that will have you meeting the new year with clarity and warm, well-nourished heart. Tuesday 1/1 - Dolphin - It’s the beginning of a brand new year full of possibilities and here you are, greeting it, despite everything you’ve had to overcome to get here. That simple fact alone is more than enough reason to celebrate, and there’s no better way to celebrate the gift of your own life than filling it with meaning and purpose. What that will look like is yours to decide, but if you’re struggling to know what path is meant for you or what your next right step is, try connecting with the most basic manifestation of your own life force--your breath. If nothing else, it’s a powerful way to drop you into a state of gratitude and a vibrational state that supports alignment and a sense of wellbeing. Make a practice of working with your breath, either through regular breath awareness meditation or pranayama breathwork, and you might find yourself moving through blocks, honing your intuitive capacities, and calling in opportunities you’ve only dreamt of in the year ahead! Wednesday 1/2 - Wild Boar - If you’re realizing that you’ve inadvertently carried some things into the new year that you wish would have stayed behind in 2018, then it’s time to roll up your sleeves. Get really honest with yourself, and anyone else around you if necessary, about what’s no longer serving you and the shifts that need to take place for you to reclaim your power. Are there any sneaky habits that you’ve been telling yourself “aren’t that big of an issue”, but you know in your heart are holding you back? Do you participate in relationship dynamics that leave you more drained than inspired? No more minimizing the impacts of negative habits and toxicity in your life! Confront them head on with open eyes and a courageous heart. If you truly do the work, you’ll have good reason to thank yourself by this time next year. Thursday 1/3 - Owl Reversed - The call for a deep personal inventory continues today. The worst lies we tell are the ones we tell ourselves. To avoid shame. To maintain an illusion of who we believe ourselves to be. To side-step the real work. But all ies require maintenance and over time they become heavier burdens to bear than the truth ever could have been. To set yourself free, you must shine a light on all the shadows that live within your own heart. This is a task that must be done with lots of compassion. The goal is not to punish yourself for being so very human, but to increase empowerment. To be able to act from a place of awareness and choice as you move forward. Friday 1/4 - Badger - The intense energies don’t seem to let up as the first week of the year comes to a close. In fact, what’s called for today is direct and assertive action. What goals did you set for the year ahead? Passivity and wishful-thinking won’t support your ability to make your dreams a reality. Whether it’s a new job or promotion, a healthier lifestyle, or a special someone you’ve been noticing for a while, go after what you want today without apology. You may not get an affirmative response, but you certainly don’t have to be the one to say no to yourself, and you just might get exactly what you ask for..or something even better. Saturday 1/5 - Spider Reversed - If you’ve found yourself tempted to meddle in other people’s business or wanting to critique everyone around you, it may be a sign that you haven’t been using your creative gifts properly. We are all gifted with the ability to create--whether that’s words or visual art or businesses or buildings that reach to the skies. If you don’t believe you’re a creative person then you’ve simply not discovered your unique form or forms of expression. One way to do so is to revisit the things that brought you joy as a child. Follow the calls that come from your soul, regardless of whether or not they seem logical. If you already know what your gifts are, it’s time to dedicate more time to cultivating them. When you are guided by passion and purpose, you radiate a quiet confidence and fulfillment that is way more likely to influence others in positive ways than words of advice ever will. Sunday 1/6 - Beaver Reversed - The messages around the importance of purpose and passion carry through to today as well. Boredom and apathy are the result of internal blocks, not external circumstances. Have you deemed your personal mission in life to be insignificant? Or yourself to be unworthy for some reason? Remember that, of all the billions of people on the planet, there is no one just like you and that is not a coincidence. With your unique life journey, qualities, gifts, and even challenges, there is something special that only you can offer the world. It doesn’t have to reshape the entire fabric of the cosmos. Every addition of goodwill and loving action in the world contributes to the betterment of life for all. Find your why. Big or small. And do something towards that purpose every single day. It really can be that simple. Monday 12/24 - Owl Reversed - While the holiday season is seen as a time for cheer and celebration, it can also be a time for getting in touch with our Shadow sides. Spiritual teach Ram Dass tells us that, “if you think you’re enlightened, go spend a week with your family” and in doing that, you might just notice how much work you still have to do to stay centered in compassion, patience, and love. The medicine here is to get honest with yourself. All those judgements you so quickly place on others reflect at least as much about you as they do anyone else. In what ways do you act out those very same traits? Even if it is on a much smaller scale or only within your heart and mind? Just because it hasn’t seen the light of day doesn’t mean that it doesn’t live within you and seep out energetically. Look closely at the ways you are hard on others, examine how you are hard on yourself for these very same things, and then offer up a little compassion for all of you. Sometimes accepting something about ourselves is the very key to healing and releasing it. Tuesday 12/25 - Grouse - Whether or not you celebrate Christmas, today is most definitely a day to celebrate life, the passing of another year, and the possibilities held within a new one ahead. Really be present with your body today and the wondrous gift it is to inhabit it, to be able to gaze upon the beauties of this world, to be able to touch a loved one or feel a brisk breeze or the warmth of a fire, to have a heart that beats for you every single day. The very best way to express gratitude for these blessings is to not take them for granted, to really utilize them, and to do so in a way that elevates your spirit and those of others around you. Whether that means to dance or sing or offer hugs or make food or to simply look at someone and make a point of truly seeing them, do it. Celebrate your life today. It is, without question, the greatest gift. Wednesday 12/26 - Badger - The time has come for you to fully express yourself, to not hold back, and to go after the thing that you most desire with everything that you’ve got. Assertiveness can be a double-edged sword--effective, but if not used carefully, potentially off-putting. They key to avoiding this pitfall is to make sure that your goals and efforts are rooted in love and sought out with integrity. You can pursue your passions without compromising your values as long as you stay flexible and creative in your approach. Thursday 12/27 - Whale Reversed - Have you’ve been feeling disconnected from your own voice, your intuition, or Spirit? It’s not uncommon for people to find themselves worked up into a frenzy during this time of year and feeling overwhelmed with social obligations, financial concerns, and heavy energy around either the year that is passing or the one ahead. If any of this is ringing true for you then you might want to consider setting aside some time to cultivate space for quiet and stillness. Spend some time out in nature alone. Meditate. Pour your heart and mind out onto the pages of a journal. These practices allow you to reconnect with your higher self and the wisdom that always lives inside of you. Sometimes you simply have to step away from the external noise long enough to be able to hear your own voice. Friday 12/28 - Skunk - One of the most empowering things you can do is to learn how to be conscious and intentional with the way you use your energy. So many misunderstandings and interpersonal issues stem from a lack of effective or clear communication and this applies to unspoken messages as much as it does the words we use. Check in with a few people you trust to speak from an honest, wise, and compassionate place. Ask them how they experience you and take note of any unexpected responses. This isn’t about judging any aspect of who you are or how you show up, but rather becoming more aware of what signals you’re putting out into the world and making sure that you are actively choosing what kind of energy you emit in each moment. Saturday 12/29 - Raven - We are constantly surrounded by magic, miracles, and things beyond any sort of logical explanation. The questions is: Are we honoring the synchronicities, the messages we receive, and the mystery of life? To do so doesn’t necessarily require a great deal of fanfare, but rather a pause, a moment of listening internally for the deeper message, and a willingness to act from a place of faith and trust when what we hear doesn’t necessarily make sense to the rational mind. This is your task today. Should you embrace it with both arms, you will be in for both a big adventure and some very unexpected blessings. Sunday 12/30 - Dragonfly - Any transformation first begins with an honest assessment of where one currently is, and as we prepare to leave one year behind and pass through the portal into a new one, we are in an especially potent moment for getting uncompromisingly honest with ourselves about who we are, what we want, how we have held ourselves back, and what we must do to step into our full light and claim the life that we know in our hearts we were meant for. Peel back the layers today. Strip away any part of you that is not fully authentic. Shine a light on all the shadows and hold whatever you find gently, so that you may release it with love. Today can be the beginning of anything you want. Who you are tomorrow is entirely up to you. Monday 12/17 - Turtle - Our connection with the earth is innate. We are, in fact, nature itself. One moving part in the unfathomably intricate dance of the cosmos. It’s easy to forget sometimes. To become so wrapped up in our own realtively tiny lives that we forget our relationship with the very ground we stand on, the air we breath, the fire that warms us, and the water that quite literally composes the majority of our body. Make a point of remembering today. Find a way to give thanks for the lands that have held you. The specific offering is not as important as the quality of your presence and the depth of your gratitude. Tuesday 12/18 - Badger Reversed - Badger medicine is rarely gentle, but tends to be both thorough and effective. It involves rooting out the source of the issue and then working with tireless focus to clear it. And honestly, there’s no better time to remove anything from your life that has been holding you back. Only a matter of days before the Winter Solstice and on the cusp of a new year, it’s time to be proactive about cleansing the toxins from your life, whether those are internal (limiting belief systems and patterns that don’t serve your highest vision of your life) or external (environmental pollutants, toxic relationships, or clutter). Just be sure you’re releasing with love because what isn’t released with love has a way of coming back around like a boomerang. Wednesday 12/19 - Whale - Finding your voice isn’t always about speaking up. Sometimes it’s about tuning in. Listening closely to those subtle shifts in your body, the heart-pulls, and the calls from your soul. These are not meaningless signals firing at random, but clues. A roadmap to your passion and purpose in this world. Study, cultivate, and honor them and you will have created the very best navigation system you could ever hope to have in this life. Thursday 12/20 - Skunk Reversed - Have you allowed yourself to get too wrapped up in concern for what others think of you lately? If so, it’s time to let go of the egoic attachment to your reputation and bring the focus back to your character--who you truly are as opposed to who people think you are. When you live your life with integrity, grace is natural and you move with an ease and empowerment that draws in opportunity and genuine connection. You won’t need to worry about gaining shallow favor from others as you will have earned deep admiration and respect through your actions. Friday 12/21 - Raven Reversed - It’s time to get back in your own lane. Dabbling in other people’s business or Spirit business, for that matter, is a risky endeavor and usually doesn’t end well. Take a deep breath, center your own energy, and then ask yourself if there are any circumstances or issues in your life that bring up tension in your body. If so, that’s very likely a sign that you are trying to exert your control over something that is not yours to begin with. Free yourself from the struggle by falling into trust and surrender. What’s meant for you will always be yours. No need to try to force it. Saturday 12/22 - Owl - Sometimes, refraining from commenting or engaging is the most powerful thing you can do and today is one of those times. Observe from a safe distance today. Interpersonal interactions and even the ebb and flow happening inside of you. If you can carve out some space in your schedule for meditation today, definitely do. If that’s not possible, at least employ extra mindfulness as you move through your activities and interactions. Solutions and next best steps will be much more apparent from this vantage point. Sunday 12/23 - Grouse Reversed - Yes, life can get heavy. But that doesn’t mean that you should cease to celebrate the light that’s always woven, however subtly, into the darkness. Today, let that celebration happen on the physical level. Move your body. Marvel at the incredible miracle of your own life. Tap into the flow of life force within your own heart-center and dance in whatever way feels most authentic and nourishing for you. This practice is so simple and also one of the most powerful methods for releasing and clearing energy. Give yourself over to it and you might just find that you close out the weekend feeling more vibrant and inspired. Monday 12/10 - Blue Heron Reversed -. Choosing the path of awareness and growth is beautifully courageous, but it’s important to not develop tunnel vision in your pursuit to become “enlightened”. Even the greatest sages and gurus know that being able to take life a little less seriously and laugh at yourself every once in a while is vital to becoming a balanced and whole human. Sometimes, dropping back into the body or connecting with community can bring just as much insight as spending hours in meditation so make sure that any self-reflection you’ve undertaken is coupled with a healthy dose of light-hearted activity, connection with others, and an understanding that perfection only exists in the mind. Tuesday 12/11 - Antelope Reversed - It’s time to get moving. It doesn’t matter which direction you choose, but choose you must. If you’ve recently found yourself stuck in analysis paralysis, it might help to remember that there are no wrong paths and that, as long as you follow the wisdom of your heart, you will always be led to the exact place you are meant to be. And, if you find yourself down a road that you no longer wish to traverse, you can always turn around or re-route. So relieve some of the pressure you’ve placed upon yourself and just take action. Wednesday 12/12 - Eagle Reversed - Have you been feeling disconnected? From yourself? From your sense of purpose? From the world around you? It is normal to feel cut off from the flow of source energy when we are discouraged or depleted--mentally, physically, or spiritually, but it is also up to us to re-establish the connection. Take some time today to remind yourself of the bigger picture and just how magical this life truly is. Hike to a beautiful vista and take in the view. Try something new. Drop into deep conversation with a stranger. Whatever you do, make sure to shake your life up a little bit so some of those stagnant energies and thoughts can clear out and make room for a fresh perspective. Thursday 12/13 - Spider Reversed - When we don’t find intentional ways to express ourselves, we are likely to end up doing so in ways that are not only unconscious, but often a bit destructive as well. This is why it is so important to not bottle up or push down your thoughts, feelings, and dreams. If you have something that you need to get out of your system but aren’t quite ready to share it with the world, purge that energy onto a canvas, a notebook, or an voice memo and then destroy it if you need to. Keep creating and outletting until your heart and body feel light again. Friday 12/14 - Black Panther - In order to step into the unknown, you must first trust. In yourself and ultimately in something greater than yourself as well. When in your life have you been seemingly assisted by unseen forces? Have you ever experienced a time where unexpected help showed up at the exact moment you need it most? Maybe it was even just a sudden burst of courage that came out of nowhere and helped you make your way through something challenging. Call on those experiences today to help you embrace the parts of your path that are not yet illuminated. We all eventually meet a day where we must walk in the dark. Stay connected to the energy of your own precious heart and you will not have to worry about where your next step will take you. Saturday 12/15 - Bat Reversed - Transitions can challenge even the most grounded of us all, but it is only when we resist change that we truly suffer. If life seems to be pushing you into something new, don’t fight it. Allow yourself to drop into the flow of the current and you’ll be more able to make choices about what opportunities you wish to take and which ones you prefer to let float on by. It may feel like you are losing parts of yourself or your life that you aren’t quite yet ready to let go of, but rest assured that more aligned possibilities are on their way to you. You only need to let go of the past so that you can be open and ready to receive them. Sunday 12/16 - Deer - Gentleness may be one of the most underrated qualities, but it has a power all its own. Our very masculine-oriented world often rewards fire and assertiveness, even aggression, and there is a time and place for making things happen by sheer force of will. However, there are also moments when dropping into tenderness and the energy of pure, innocent love is called for and today is one of those days. Where can you soften? Where can you drop the need to push and shove your way through others or even through yourself? Cultivate a deeper sense of patience and compassion, offer it freely to yourself and those around, and watch previously impenetrable barriers crumble all around you.